After 50 people were gunned down in terrorist attacks at two mosques in Christchurch, New Zealand, on Friday, the prime minister is vowing to change gun laws. At least one gunman carried out what is now the deadliest shooting in New Zealand history. Forty-two others were injured, including two critically, in what became "one of New Zealand's darkest days," New Zealand Prime Minister Jacinda Ardern said. 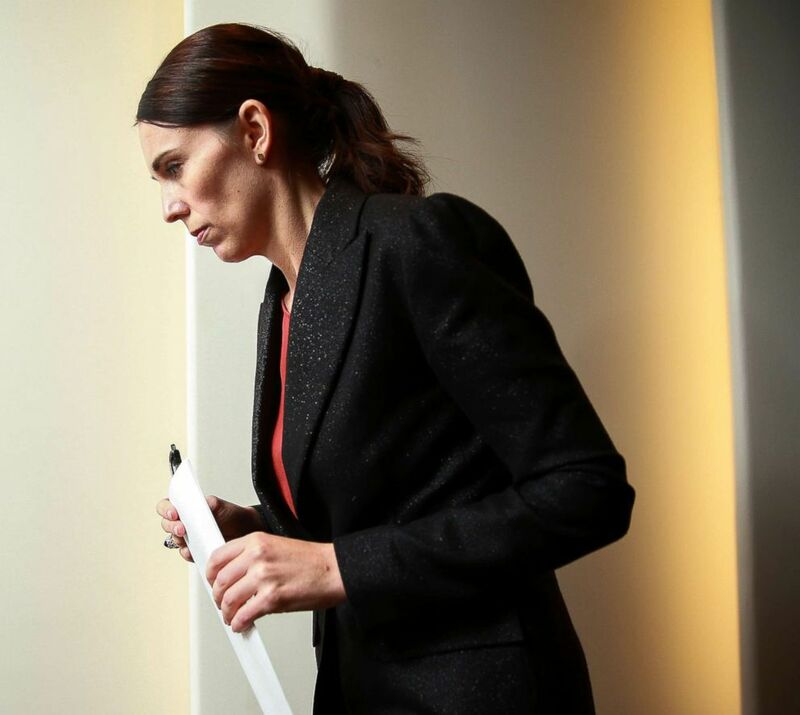 Ardern said Saturday, "While the nation grapples with a form of grief and anger that we have not experienced before, we are seeking answers." (Mark Baker/AP) People wait outside a mosque in central Christchurch, New Zealand, March 15, 2019. A gunman appeared to have livestreamed video of the shooting on social media, according to New Zealand police. He documented his trip from his car and into the worship center in central Christchurch, where he opened fire indiscriminately, police said. Officials said they were working to remove "extremely distressing footage" taken at the scene and urged social media users not to share it. Meanwhile, Sky Network Television -- New Zealand’s largest satellite television provider -- announced late Friday that it was removing Sky News Australia from its platform after the broadcaster apparently aired video of the attack. “We stand in support of our fellow New Zealanders and have made the decision to remove Sky News Australia from our platform until we are confident that the distressing footage from yesterday’s events will not be shared,” Sky Network officials said in a tweet. Three people are in custody, including one Australian citizen. Brenton Tarrant, 28, was charged with murder and appeared in court Saturday, officials said. Authorities also said that the murder suspect will be facing more charges. “While the man is currently facing only one charge, further charges will be laid," New Zealand police officials tweeted from the department's verified account. Five guns were used by the main suspect, including two semi-automatic weapons and two shotguns, the prime minister said at a news conference Saturday. The suspect had a gun license, she added. Police have not said if the same gunman shot at both mosques. “None of those apprehended had a criminal history either here or in Australia," and none were on any watch lists, Ardern said. Late Friday night, New Zealand Police Commissioner Mike Bush told reporters that authorities are still "working through" the accounts of two additional people who were arrested as part of the investigation. (Hagen Hopkins/Getty Images) Prime Minister Jacinda Ardern exits after a press conference at Parliament, March 15, 2019, in Wellington, New Zealand. Bush said that local authorities responded "immediately" to the reports of gunfire, and that within 36 minutes of the first shot being fired, the primary suspect was taken into custody. “That person was not willing to be arrested, I think you’ve probably seen some of that live video, there was live audio coming back to my command center in Wellington, of that apprehension and I can tell you as I was listening to that –- that person was non-compliant," Bush said. 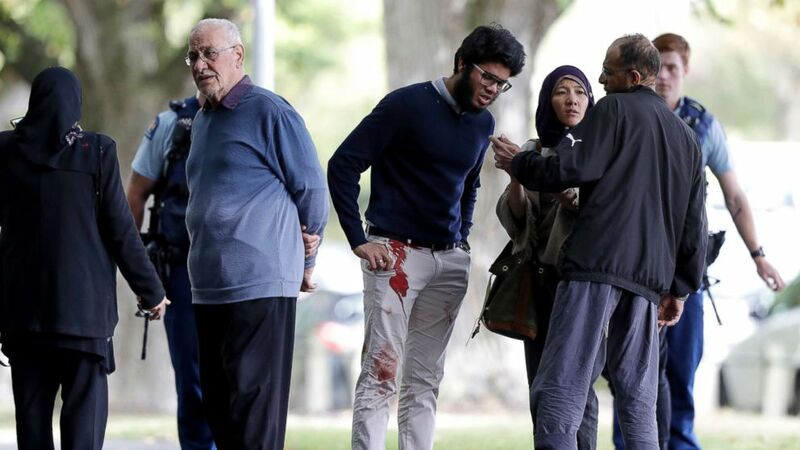 “This attack has been an enormous shock for all New Zealanders, and I am aware that there is a real sense of fear and concern for personal safety, particularly among our Muslim communities,” Bush said in a statement. He said that there is a heightened police presence nationwide, particularly at mosques and community events, and urged residents to immediately report anything suspicious to local authorities. 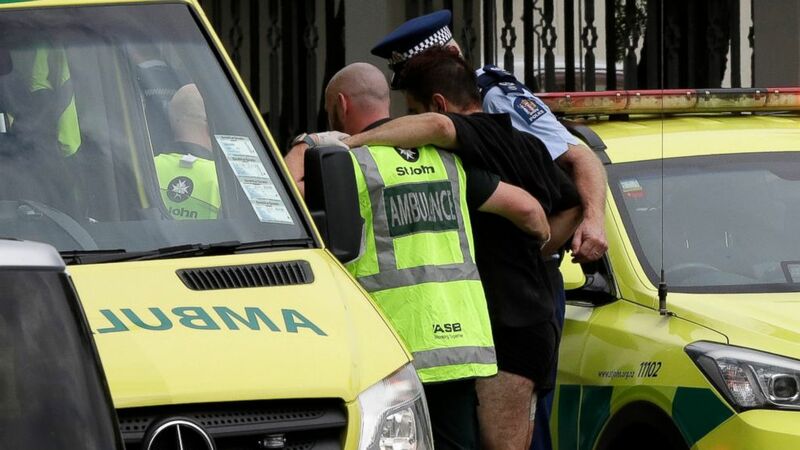 Four of the 50 people killed in the massacre died on the way to the hospital, said Greg Robertson, chief of surgery at Christchurch Hospital. The surgeon went on to tell reporters on Friday night that 36 patients remained hospitalized at the Christchurch facility – 11 of them in the intensive care unit. He said the severity of injuries range from soft tissue injuries to head trauma. A 4-year-old girl wounded in the attack had to be transferred to another hospital in critical condition. Witnesses said the attack occurred just before 1:40 p.m. local time as the Sheikh gave a sermon in Christchurch. "He just came in and he was shooting ad hoc," Ramzan Ali told The Associated Press. Ali said he survived by hiding beneath a bench. "I haven't seen him because I just lied down under the bench, thinking that if I get out, I'll get shot," he said. "I'm just keeping my fingers crossed so I could be alive." He added: "I was the last guy to come out of the mosque after the shooting stopped and on the doors there were a lot of bodies." 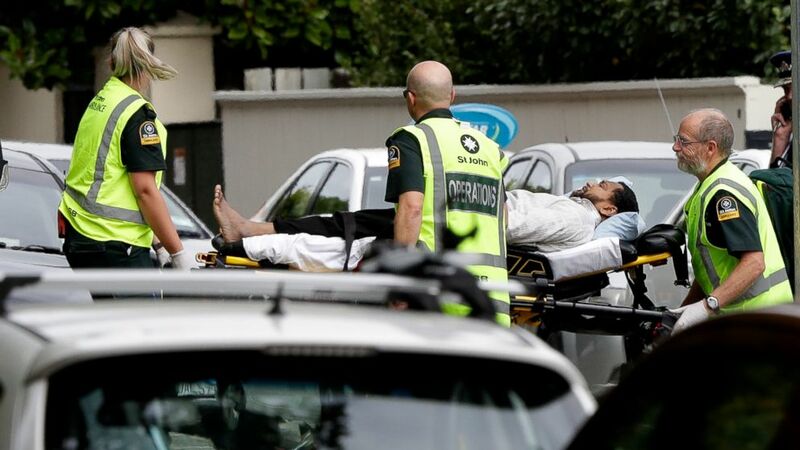 (AP) Police and ambulance staff help a wounded man from outside a mosque in central Christchurch, New Zealand, Friday, March 15, 2019. 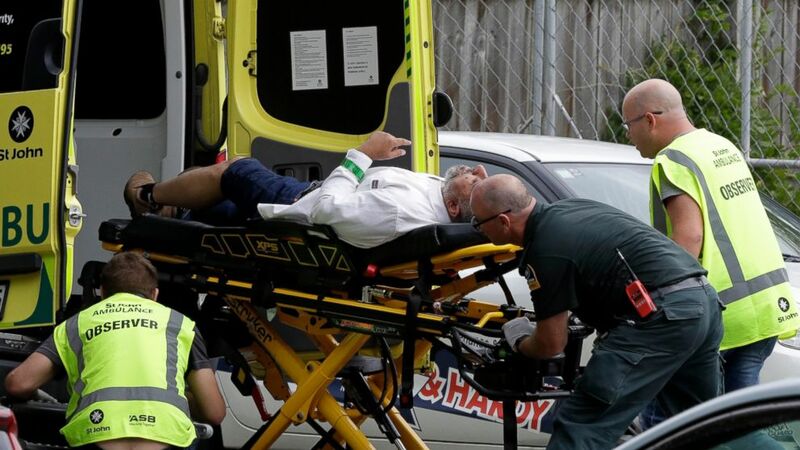 A witness says many people have been killed in a mass shooting at a mosque in the New Zealand city of Christchurch. "It's something that we never expected to have happen here," Christchurch MP Gerry Brownlee told "Good Morning America." "We're a relatively small population, and while we are ethnically quite diverse, we live very peaceable lives. And this, as many have seen, has shattered our innocence." Brownlee, who said he lives a short distance from one of the shooting sites, said, "Almost everyone will know someone or have a connection with the families of someone who has been either killed or seriously wounded today." (Mark Baker/AP) A man reacts as he speaks on a mobile phone outside a mosque in central Christchurch, New Zealand, March 15, 2019. 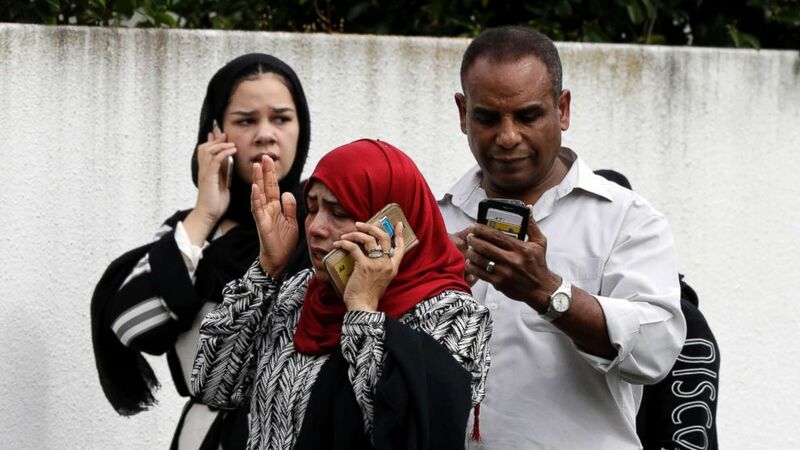 Of the 50 people killed, New Zealand police said 41 victims died at the Deans Avenue Mosque, seven at the Linwood Avenue Mosque and one at a hospital. “He is not from here,” Dalziel said Saturday of the attacker. “He came here. He came here with hate in his heart and intention to kill in his mind. So he did not develop his hatred here. He came here to perform this act of terrorism." "His was the voice of hate, and the only way that communities can respond to the voice of hate is to come together and love, compassion and kindness," she said. (Mark Baker/AP) People stand across the road from a mosque in central Christchurch, New Zealand, March 15, 2019. Queen Elizabeth in a statement said she's "deeply saddened by the appalling events in Christchurch." "Prince Philip and I send our condolences to the families and friends of those who have lost their lives. I also pay tribute to the emergency services and volunteers who are providing support to those who have been injured," she said. "At this tragic time, my thoughts and prayers are with all New Zealanders." Friday afternoon President Trump said he spoke with New Zealand's prime minister about the "monstrous terrorist attacks." "These sacred places of worship were turned into scenes of evil killing," Trump said. "It's a horrible, horrible thing. I told the prime minister the United States is with them all the way, 10 percent, whatever they need, we will be there." 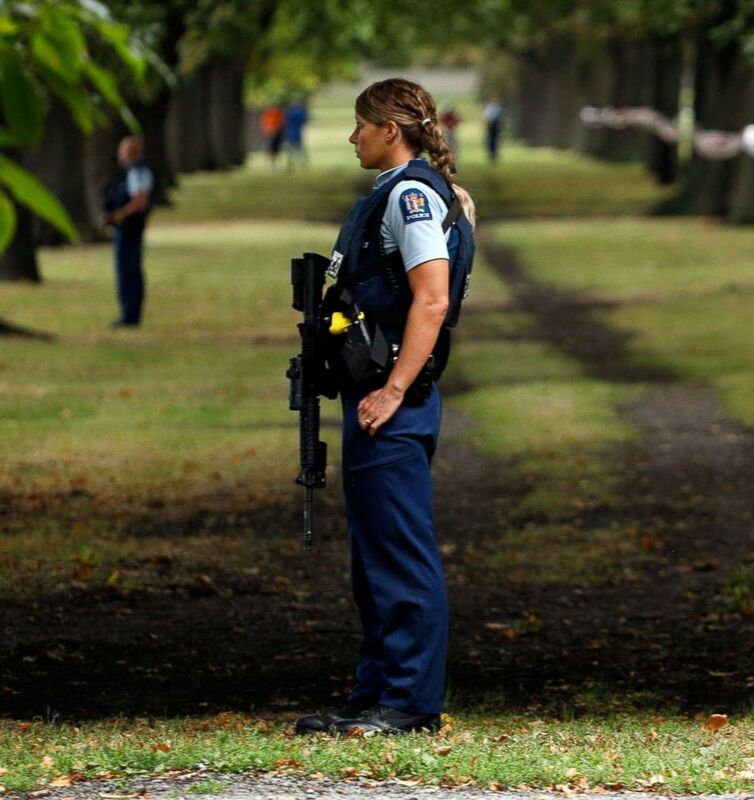 (Tessa Burrows/AFP/Getty Images) Police officers guard the area close to the Masjid al Noor mosque after a shooting incident in Christchurch, March 15, 2019. The president went on to call New Zealand a great friend and asserted that "our relationship has never been better." President Trump had also tweeted condolences Friday morning, at which point the death toll was still 49. "My warmest sympathy and best wishes goes out to the people of New Zealand after the horrible massacre in the Mosques. 49 innocent people have so senselessly died, with so many more seriously injured," he tweeted. "The U.S. stands by New Zealand for anything we can do. God bless all!" U.S. Attorney General William Barr in a statement called the attack "a sobering reminder that the threat of political and religious violence is real and that we must remain vigilant against it." U.S. Homeland Security Secretary Kirstjen Nielsen said in a statement, "While we are not aware of any current, credible or active threat domestically, nor of any current information regarding obvious ties between the perpetrators in New Zealand and anyone in the US -- the Department is cognizant of the potential concerns members of Muslim-American communities may have as they gather at today’s congregational prayers." "Attacks on peaceful people in their place of worship are abhorrent and will not be tolerated," Nielsen stressed. "The Department strongly stands with those of all faiths as they seek to worship in peace and we will continue to work with stakeholders to protect the ability of all to worship freely and without fear." ABC News' Ben Gittleson, Jordyn Phelps, J. Gabriel Ware, Matt Foster, Will Gretsky and Darren Reynolds contributed to this report.